Sales professionals throughout Northeast Ohio who seek to take their sales game to the next level will want to join Marvin Montgomery, a world-renowned author, professional sales trainer and motivational speaker, during his upcoming four-session series on sales success. 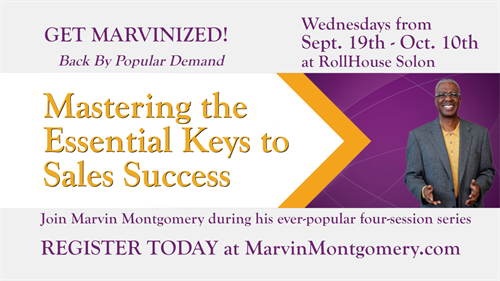 Marvin’s hugely popular series, “Mastering the Essential Keys to Sales Success with Marvin Montgomery,” is a highly interactive four-week series held every Wednesday from September 19 through October 10. The series features practice-oriented approaches to guarantee improvement in participants’ personal sales results. Most importantly, each participant will leave with a Personal Action Plan that will hold them accountable to implement what they learned in class. The seminar is designed for anyone who wants to increase their sales productivity. Whether you sell inside or outside, retail or commercial, this seminar will change your habits for the better and boost your sales. This series is also ideal for anyone in a business development role. Likewise, business owners can implement these same selling techniques in their own companies. Each of the four sessions will begin with a continental breakfast and networking event starting at 8 a.m. followed by the training from 8:30 a.m. – 10:30 a.m. Each session will be held at RollHouse Solon (formerly Freeway Lanes), 33185 Bainbridge Road, Solon, Ohio 44139. Your investment for all four sessions is $395 per person, or $345 per person for groups of two or more as well as previous Marvin Montgomery consulting clients and subscribers to Marvin’s weekly tip. For more information, visit Marvin’s event page, call Marvin Montgomery at (216) 509-0281, or email SalesDoctor@MarvinMontgomery.com.